That’s why businesses need to factor potentially massive business model disruptions into their plans for digital transformation today if they want to remain competitive with organizations in early adopter countries like China and Germany. China, for example, is already halfway through an US$ 88 billion upgrade to its state electricity grid that will enable renewable energy transmission around the country—all managed and moved digitally, according to an article in The Economist magazine. And it is competing with the United States for leadership in self-driving vehicles, which will shift the transportation process and revenue streams heavily to digital, according to an article in Wired magazine. China and some countries within the EU, such as Germany and France, are the most likely leaders in the transition toward a renewable, energy-based infrastructure because they have been able to align the government and private sectors in long-term energy planning. In the EU for example, wind has already overtaken coal as the second largest form of power capacity behind natural gas, according to an article in TheGuardian newspaper. Indeed, Rifkin has been working with China, the EU, and governments, communities, and utilities in Northern France, the Netherlands, and Luxembourg to begin building these new internets. Meanwhile, thanks in part to generous government financial support, Germany is already producing 35% of its energy from renewables, according to an article in TheIndependent, and there is near unanimous citizen support (95%, according to a recent government poll) for its expansion. On the other hand, there are many areas of the world where distributed, decentralized, renewable power generation already makes more sense than a centralized fossil fuel–powered grid. More than 20% of Indians in far flung areas of the country have no access to power today, according to an article in TheGuardian. Locally owned and managed solar and wind farms are the most economical way forward. The same is true in other developing countries, such as Afghanistan, where rugged terrain, war, and tribal territorialism make a centralized grid an easy target, and mountainous Costa Rica, where strong winds and rivers have pushed the country to near 100% renewable energy, according to TheGuardian. As Daimler’s experience shows, driverless vehicles will push autonomous transportation and automated logistics up the strategic agenda within the next few years. Boston Consulting Group predicts that the driverless vehicle market will hit $ 42 billion by 2025. If that happens, it could have a lateral impact across many industries, from insurance to healthcare to the military. Germany, for example, has set a target of 80% renewables for gross power consumption by 2050, according to TheIndependent. If the cost advantages of renewables bear out, German businesses, which are already the world’s third-largest exporters behind China and the United States, could have a major competitive advantage. As 2015 winds down, it’s time to look forward to 2016 and explore the social media and content marketing trends that will impact marketing strategies over the next 15 months or so. Some of the upcoming trends simply indicate an intensification of current trends, however others indicate that there are new things that will have a big impact in 2016. Take a look at a few trends that should definitely factor in your planning for 2016. Clearly Google is going nowhere. In fact, in 2016 Google’s word will still essentially be law when it comes to search engine optimization. However, in 2016 there will be some changes in SEO. Many of these changes will be due to the fact that users are increasingly searching for products and services directly from websites such as Facebook, Pinterest, and YouTube. Customers are relying more and more on customer comments, feedback, and reviews before making purchasing decisions. This means that they are most likely to search directly on platforms where they can find that information. Customers who are seeking information about products and services feel that video- and image-based content is more trustworthy. Most marketers would be hard-pressed to look at this list and see any case for continuing to avoid mobile and touchscreen optimization. Yet, for some reason many companies still see mobile optimization as something that is nice to do, but not urgent. This lack of a sense of urgency seemingly ignores the fact that more than 80% of the highest growing group of consumers indicate that it is highly important that retailers provide mobile apps that work well. According to the same study, nearly 90% of Millennials believe that there are a large number of websites that have not done a very good job of optimizing for mobile. Platforms such as Instagram and Snapchat weren’t considered to be valid targets for mainstream content marketing efforts until now. This is because they were considered to be too unproven and too “on the fringe” to warrant the time and marketing budget investments, when platforms such as Facebook and YouTube were so popular and had proven track records when it came to content marketing opportunity and success. However, now that Instagram is enjoying such tremendous growth, and is opening up advertising opportunities to businesses beyond its brand partners, it (along with other platforms) will be seen as more and more viable in 2016. In 2016, Facebook will likely remain the flagship social media website when it comes to sharing and promoting content, engaging with customers, and increasing Internet recognition. However, it will become less and less possible to ignore the fact that younger consumers are moving away from the platform as their primary source of online social interaction and content consumption. Some companies may be able to maintain status quo for 2016 without feeling any negative impacts. However, others may need to rethink their content marketing strategies for 2016 to take these shifts into account. Depending on their branding and the products or services that they offer, some companies may be able to profit from these changes by customizing the content that they promote on Facebook for an older demographic. More and more businesses are focusing marketing efforts on content. This means that, as customers have more content to choose from, competition is going to increase significantly. Both B2B and B2C buyers value video based content over text based content. While some curated content is a good thing, consumers believe that custom content is an indication that a company wishes to create a relationship with them. The great majority of these same consumers report that customized content is useful for them. B2B customers prefer learning about products and services through content as opposed to paid advertising. Consumers believe that videos are more trustworthy forms of content than text. A final, very important thing to note when considering content trends for 2016 is the decreasing value of the keyword as a way of optimizing content. In fact, in an effort to crack down on keyword stuffing, Google’s optimization rules have been updated to to kick offending sites out of prime SERP positions. Oculus Rift is not likely to offer much to marketers in 2016. After all, it isn’t expected to ship to consumers until the first quarter. However, what Oculus Rift will do is influence the decisions that marketers make when it comes to creating customer interaction. For example, companies that have not yet embraced storytelling may want to make 2016 the year that they do just that, because later in 2016 Oculus Rift may be the platform that their competitors will be using to tell stories while giving consumers a 360-degree vantage point. For a deeper dive on engaging with customers through storytelling, see Brand Storytelling: Where Humanity Takes Center Stage. Editor’s note: This article ‘Tis the Season: 11 Best Practices for Holiday Campaigns was originally published on CMO.com in October 2017. Summer flew by in a blur, as it always seems to, and all of a sudden the beginning of the holiday shopping season is just weeks away. The time for digital marketers to prepare for crunch time is right now. Digital holiday sales continue to grow in importance. Last year, Cyber Monday generated a record $ 3.45 billion in sales, just $ 110 million shy of traditional Black Friday sales in 2016. For the full season, online retailers took in a record $ 91 billion in sales, while mall traffic sank 12.3% in November and December of 2016. Competition for the digitally acquired sale keeps increasing, and marketers really need to have their act together. The inbox is crowded real estate during the holiday season. Not only do messages have to pop to compete, they also have to be supported by the right sets of tools and infrastructure. Keep in mind that in 2016, retailers sent 55% more emails on Black Friday, and 42% more on Cyber Monday than they did in 2015. Preparations need to be made for similar increases in growth this holiday season. This means marketing automation and email providers have a lot to do to prepare for Black Friday, Cyber Monday, and the entire holiday shopping season. Because email lists and the infrastructure to process digital campaigns are the backbones of successful digital holiday campaigns, think of your No. 1 priority as checking email lists, and checking them twice. Here are some tips for things you can start doing today to help assure success this holiday season. Email list hygiene: Up to 17% of Americans create a new email address every six months, and 30% of subscribers change email addresses annually. Chances are, one-third of email lists go bad every year. Determine an appropriate period since the last engagement for a specific account to be removed. Consider tests to clean lists of bounce-backs, assuring the highest possible percentage of successful deliveries. Start reactivation campaigns now: Identify opportunities to engage with accounts at risk of becoming dormant. Create offers and build personalized onboarding experiences for individual users. Complete customer profiles: The more data you have on individual customers, the better you can personalize offerings. Offering an incentive to customers to finish customer profiles, which may have been originally started some time ago, can lead to better data collection. 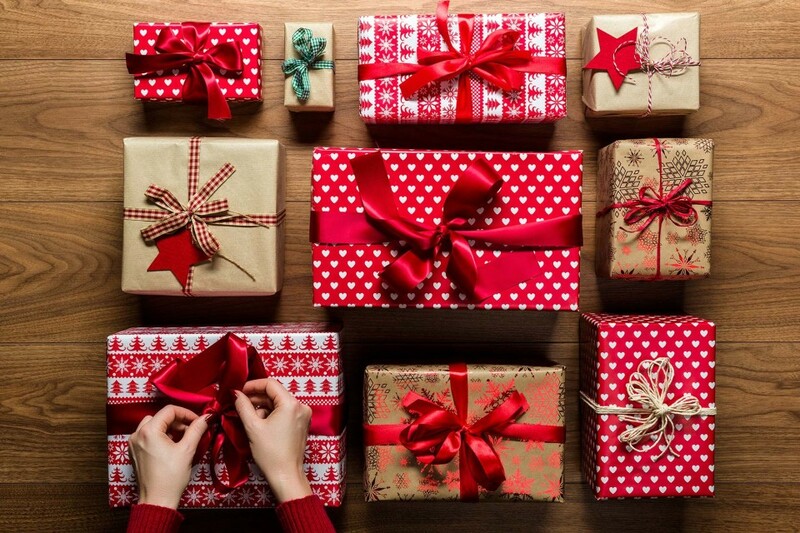 Kick off nurturing campaigns: Advancing relationships with customers today will make them more receptive to holiday campaigns when released in November. Don’t just focus on Black Friday or Cyber Monday: The holiday season is longer than just a day or two. Start engaging as soon as possible and continue throughout the holiday season. Analyze clicks and offer additional incentives if sales aren’t made on the first attempt. Review current levels of engagement: Analyze this information to identify patterns related to active versus non-active accounts. Avoid data fatigue: How much email is too much email is a tricky question. Inevitably, some email accounts will go dormant or will ask to be removed. If email lists that you created have increasing numbers of dormant accounts, set policies to remove email addresses if reactivation plans aren’t successful. Create urgency: Uninteresting emails won’t be opened. Instill urgency in subject lines by offering a special discount that must be used within a certain period. Link email campaigns with other digital marketing activities: All digital marketing activities should be tracked and reinforced through each other. Banner ads, Adwords, and SEO strategies can support email campaigns and close additional sales. Ensure networks can handle increases in email traffic: Evaluate last year’s activity and plan for a 10% to 20% increase in volume, and be prepared to add more sending capacity if needed. Set realistic expectations and goals: Look at past performance and current resources to set realistic digital sales goals. If sales aren’t living up to initial projections early in the season, avoid the temptation to increase the volume of emails, which will lead to list fatigue. Time is running out. But with the right planning, email campaigns can still deliver great results during the holiday crunch time when they matter most. Remember to document best practices as well as what didn’t work and incorporate findings in future campaigns. Good luck! It’s that wonderful time of year again. Holiday lights, turkeys and hams, cranberries, and oh – super awkward conversations with family members. We care about your success with Dynamics 365 – including its interaction with your family. 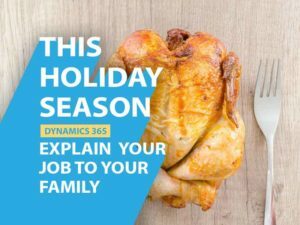 That’s why today’s blog is all about how to explain your job as a Dynamics 365 expert to your family members – including those who still think upgrading Windows® means remodeling your home. Of course, Dynamics 365 is all about customized experiences, so we’re providing a solution for each conversation. Your parents want to be proud of you; help them out with some bragging sound bites. Explain to them that you work with the cool Microsoft product called Dynamics 365. It tracks all kinds of data so that your company can make everyone’s life easier. As a Dynamics 365 expert for your business, you are loved by everyone. Operations loves you because you helped them reduce expenses by making the business more efficient. Marketing loves you because they want to marketing to people that need your services, and you helped them identify the right people. Sales loves you because you helped them connect with lots of people who love your company, and everyone else – especially your company’s leadership – loves you because you’re making the company better. Your parents will still find more ways to tell people how amazing you are, but at least it’s a start! the Rolodex! That’s why you love your job. You basically get to help people create and use a Rolodex to help them do their job better. Why is that? Dynamics 365 is all about customization. “Don’t you just hate when those telemarketers call during dinnertime, Grandpa? Me too. I help my Sales team learn who actually wants to be contacted and how so they can stop annoying those of us who don’t want dinner interrupted.” You’ll win major bonus points with that one! Kids understand how technology works better than many **cough** most **cough** adults. However, from Finance and Operations to Customer Engagement, the end-to-end Dynamics 365 platform is a lot to take in – even for those working with it every day. Simplify it. Tell the kids table you work with a computer program that helps people make smart choices. No, corporations aren’t trying to control you, but that’s not going to stop your uncle from saying they are. Dynamics 365 isn’t about mind-control; it’s about options. Explain to the skeptical uncle that if you’re buying a car, you want a choice. You want colors, makes, models – and you definitely want the Sales person to schmooze you (unless you prefer shopping online). You don’t want the Salesperson pushing a gas guzzler when you’re looking for an economy car. Well, Dynamics 365 experts help companies provide these options. It uses the information you choose to share to help the Salesperson know exactly what options the customer wants, rather than the Salesperson pitching the car that’s rusting away on their lot. This aunt understands choices. Most people understand the food is amazing, but not everybody wants the gravy. Or maybe someone doesn’t want stuffing, but they want the turkey; they only want the mashed potatoes if they come with gravy on them. Dynamics 365 is a lot like this. The best companies understand Dynamics 365 is an incredible tool, but not all companies need all the workloads. Some only want help managing their operations. Dynamics 365 helps provide choices – even to companies wanting to use the product themselves! We hope this helps you at the dinner table! Not enough to escape the family interrogations? You can always go hide and binge watch some of our PO TV videos! When outspoken venture capitalist and Netscape co-founder Marc Andreessen wrote in The Wall Street Journal in 2011 that software is eating the world, he was only partly correct. In fact, business services based on software platforms are what’s eating the world. Companies like Apple, which remade the mobile phone industry by offering app developers easy access to millions of iPhone owners through its iTunes App Store platform, are changing the economy. However, these world-eating companies are not just in the tech world. They are also emerging in industries that you might not expect: retailers, finance companies, transportation firms, and others outside of Silicon Valley are all at the forefront of the platform revolution. These outsiders are taking platforms to the next level by building them around business services and data, not just apps. Companies are making business services such as logistics, 3D printing, and even roadside assistance for drivers available through a software connection that other companies can plug in to and consume or offer to their own customers. There are two kinds of players in this business platform revolution: providers and participants. Providers create the platform and create incentives for developers to write apps for it. Developers, meanwhile, are participants; they can extend the reach of their apps by offering them through the platform’s virtual shelves. Business platforms let companies outside of the technology world become powerful tech players, unleashing a torrent of innovation that they could never produce on their own. Good business platforms create millions in extra revenue for companies by enlisting external developers to innovate for them. It’s as if strangers are handing you entirely new revenue streams and business models on the street. Powering this movement are application programming interfaces (APIs) and software development kits (SDKs), which enable developers to easily plug their apps into a platform without having to know much about the complex software code that drives it. Developers get more time to focus on what they do best: writing great apps. Platform providers benefit because they can offer many innovative business services to end customers without having to create them themselves. Any company can leverage APIs and SDKs to create new business models and products that might not, in fact, be its primary method of monetization. However, these platforms give companies new opportunities and let them outflank smaller, more nimble competitors. Indeed, the platform economy can generate unbelievable revenue streams for companies. According to Platform Revolution authors Geoffrey G. Parker, Marshall W. Van Alstyne, and Sangeet Paul Choudary, travel site Expedia makes approximately 90% of its revenue by making business services available to other travel companies through its API. In TechCrunch in May 2016, Matt Murphy and Steve Sloane wrote that “the number of SaaS applications has exploded and there is a rising wave of software innovation in APIs that provide critical connective tissue and increasingly important functionality.” ProgrammableWeb.com, an API resource and directory, offers searchable access to more than 15,000 different APIs. According to Accenture Technology Vision 2016, 82% of executives believe that platforms will be the “glue that brings organizations together in the digital economy.” The top 15 platforms (which include companies built entirely on this software architecture, such as eBay and Priceline.com) have a combined market capitalization of US$ 2.6 trillion. It’s time for all companies to join the revolution. Whether working in alliance with partners or launching entirely in-house, companies need to think about platforms now, because they will have a disruptive impact on every major industry. Several factors converged to make monetizing a company’s business services easier. Many of the factors come from the rise of smartphones, specifically the rise of Bluetooth and 3G (and then 4G and LTE) connections. These connections turned smartphones into consumption hubs that weren’t feasible when high-speed mobile access was spottier. One good example of this is PayPal’s rise. In the early 2000s, it functioned primarily as a standalone web site, but as mobile purchasing became more widespread, third-party merchants clamored to integrate PayPal’s payment processing service into their own sites and apps. In Platform Revolution, Parker, Van Alstyne, and Choudary claim that “platforms are eating pipelines,” with pipelines being the old, direct-to-consumer business methods of the past. The first stage of this takeover involved much more efficient digital pipelines (think of Amazon in the retail space and Grubhub for food delivery) challenging their offline counterparts. What Makes Great Business Platforms Run? The quality of the ecosystem that powers your platform is as important as the quality of experience you offer to customers. Here’s how to do it right. Although the platform economy depends on them, application programming interfaces (APIs) and software development kits (SDKs) aren’t magic buttons. They’re tools that organizations can leverage to attract users and developers. To succeed, organizations must ensure that APIs include extensive documentation and are easy for developers to add into their own products. Another part of platform success is building a general digital enterprise platform that includes both APIs and SDKs. A good platform balances ease of use, developer support, security, data architecture (that is, will it play nice with a company’s existing systems? ), edge processing (whether analytics are processed locally or in the cloud), and infrastructure (whether a platform provider operates its own data centers and cloud infrastructure or uses public cloud services). The exact formula for which elements to embrace, however, will vary according to the use case, the industry, the organization, and its customers. In all cases, the platform should offer a value proposition that’s a cut above its competitors. That means a platform should offer a compelling business service that is difficult to duplicate. By creating open standards and easy-to-work-with tools, organizations can greatly improve the platforms they offer. APIs and SDKs may sound complicated, but they’re just tools for talented people to do their jobs with. Enable these talented people, and your platform will take off. In the second stage, platforms replace pipelines. Platform Revolution’s authors write: “The Internet no longer acts merely as a distribution channel (a pipeline). It also acts as a creation infrastructure and a coordination mechanism. Platforms are leveraging this new capability to create entirely new business models.” Good examples of second-stage companies include Airbnb, DoubleClick, Spotify, and Uber. Many companies taking advantage of platforms were around long before APIs, or even the internet, existed. Allstate, one of the largest insurers in the United States, has traditionally focused on insurance services. But recently, the company expanded into new markets—including the platform economy. Allstate companies Allstate Roadside Services (ARS) and Arity, a technology company founded by Allstate in late 2016, have provided their parent company with new sources of revenue, thanks to new offerings. ARS launched Good Hands Rescue APIs, which allow third parties to leverage Allstate’s roadside assistance network in their own apps. Meanwhile, Arity offers a portfolio of APIs that let third parties leverage Allstate’s aggregate data on driver behavior and intellectual property related to risk prediction for uses spanning mobility, consumer, and insurance solutions. For example, Verizon licenses an Allstate Good Hands Rescue API for its own roadside assistance app. And automakers GM and BMW also offer roadside assistance service through Allstate. Potential customers for Arity’s API include insurance providers, shared mobility companies, automotive parts makers, telecoms, and others. One of Allstate’s major challenges is a change in auto ownership that threatens the traditional auto insurance model. No-car and one-car households are on the rise, ridesharing services such as Uber and Lyft work on very different insurance models than passenger cars or traditional taxi companies, and autonomous vehicles could disrupt the traditional auto insurance model entirely. This means that companies like Allstate are smart to look for revenue streams beyond traditional insurance offerings. The intangible assets that Allstate has accumulated over the years—a massive aggregate collection of driver data, an extensive set of risk models and predictive algorithms, and a network of garages and mechanics to help stranded motorists—can also serve as a new revenue stream for the future. By offering two distinct API services for the platform economy, Allstate is also able to see what customers might want in the future. While the Good Hands Rescue APIs let third-party users integrate a specific service (such as roadside assistance) into their software tools, Arity instead lets third-party developers leverage huge data sets as a piece of other, less narrowly defined projects, such as auto maintenance. As Arity gains insights into how customers use and respond to those offerings, it gets a preview into potential future directions for its own products and services. Another example of innovation fueling the platform economy doesn’t come from a boldfaced tech name. Instead, it comes from a relatively small startup that has nimbly built its business model around data with an interesting twist: it turns its customers into entrepreneurs. Farmobile is a Kansas City–based agriculture tech company whose smart device, the Passive Uplink Connection (PUC), can be plugged into tractors, combines, sprayers, and other farm equipment. Farmobile uses the PUC to enable farmers to monetize data from their fields, which is one of the savviest routes to success with platforms—making your platform so irresistible to end consumers that they foment the revolution for you. Once installed, says CEO Jason Tatge, the PUC streams second-by-second data to farmers’ Farmobile accounts. This gives them finely detailed reports, called Electronic Field Records (EFRs), that they can use to improve their own business, share with trusted advisors, and sell to third parties. The PUC gives farmers detailed records for tracking analytics on their crops, farms, and equipment and creates a marketplace where farmers can sell their data to third parties. Farmers benefit because they generate extra income; Farmobile benefits because it makes a commission on each purchase and builds a giant store of aggregated farming data. This last bit is important if Farmobile is to successfully compete with traditional agricultural equipment manufacturers, which also gather data from farmers. Farmobile’s advantage (at least for now) is that the equipment makers limit their data gathering to their existing customer bases and sell it back to them in the form of services designed to improve crop yields and optimize equipment performance. Farmobile, meanwhile, is trying to appeal to all farmers by sharing the wealth, which could help it leapfrog the giants that already have large customer bases. “The ability to bring data together easily is good for farmers, so we built API integrations to put data in one place,” says Tatge. So far, Farmobile’s customers have sent the Data Store approximately 4,200 completed EFRs for both planting and harvest, which will serve as the backbone of the company’s data monetization efforts. Eventually, Farmobile hopes to expand the offerings on the Data Store to include records from at least 10 times as many different farm fields. Another model for the emerging business platform world comes from Under Armour, the sports apparel giant. Alongside its very successful clothing and shoe lines, Under Armour has put its platform at the heart of its business model. But rather than build a platform itself, Under Armour has used its growing revenues to create an industry-leading ecosystem. Over the past decade, it has purchased companies that already offer APIs, including MapMyFitness, Endomondo, and MyFitnessPal, and then linked them all together into a massive platform that serves 30 million consumers. This strategy has made Under Armour an indispensable part of the sprawling mobile fitness economy. According to the company’s 2016 annual results, its business platform ecosystem, known as the Connected Fitness division, generated $ 80 million in revenue that year—a 51% increase over 2015. By combining existing APIs from its different apps with original tools built in-house, extensive developer support, and a robust SDK, third-party developers have everything they need to build their own fitness app or web site. Depending on their needs, third-party developers can sign up for several different payment plans with varying access to Under Armour’s APIs and SDKs. Indeed, the company’s tiered developer pricing plan for Connected Fitness, which is separated into Starter, Pro, and Premium levels, makes Under Armour seem more like a tech company than a sports apparel firm. As a result, Under Armour’s APIs and SDKs are the underpinnings of a vast platform cooperative. Under Armour’s apps seamlessly integrate with popular services like Fitbit and Garmin (even though Under Armour has a fitness tracker of its own) and are licensed by corporations ranging from Microsoft to Coca-Cola to Purina. They’re even used by fitness app competitors like AthletePath and Lose It. A large part of Under Armour’s success is the sheer amount of data its fitness apps collect and then make available to developers. MyFitnessPal, for instance, is an industry-leading calorie and food tracker used for weight loss, and Endomondo is an extremely popular running and biking record keeper and route-sharing platform. One way of looking at the Connected Fitness platform is as a combination of traditional consumer purchasing data with insights gleaned from Under Armour’s suite of apps, as well as from the third-party apps that Under Armour’s products use. Indeed, Under Armour gets a bonus from the platform economy: it helps the company understand its customers better, creating a virtuous cycle. As end users use different apps fueled by Under Armour’s services and data-sharing capabilities, Under Armour can then use that data to fuel customer engagement and attract additional third-party app developers to add new services to the ecosystem. The most successful business platforms have three things in common: They’re easy to work with, they fulfill a market need, and they offer data that’s useful to customers. For instance, Farmobile’s marketplace fulfills a valuable need in the market: it lets farmers monetize data and develop a new revenue stream that otherwise would not exist. Similarly, Allstate’s Arity experiment turns large volumes of data collected by Allstate over the years into a revenue stream that drives down costs for Arity’s clients by giving them more accurate data to integrate into their apps and software tools. Meanwhile, Under Armour’s Connected Fitness platform and API suite encourage users to sign up for more apps in the company’s ecosystem. If you track your meals in MyFitnessPal, you’ll want to track your runs in Endomondo or MapMyRun. Similarly, if you’re an app developer in the health and fitness space, Under Armour has a readily available collection of tools that will make it easy for users to switch over to your app and cheaper for you to develop your app. As the platform economy grows, all three of these approaches—Allstate’s leveraging of its legacy business data, Farmobile’s marketplace for users to become data entrepreneurs, and Under Armour’s one-stop fitness app ecosystem—are extremely useful examples of what happens next. In the coming months and years, the platform economy will see other big changes. In 2016 for example, Apple, Microsoft, Facebook, and Google all released APIs for their AI-powered voice assistant platforms, the most famous of which is Apple’s Siri. The introduction of APIs confirms that the AI technology behind these bots has matured significantly and that a new wave of AI-based platform innovation is nigh. (In fact, Digitalistpredicted last year that the emergence of an API for these AIs would open them up beyond conventional uses.) New voice-operated technologies such as Google Home and Amazon Alexa offer exciting opportunities for developers to create full-featured, immersive applications on top of existing platforms. We will also see AI- and machine learning–based APIs emerge that will allow developers to quickly leverage unstructured data (such as social media posts or texts) for new applications and services. For instance, sentiment analysis APIs can help explore and better understand customers’ interests, emotions, and preferences in social media. As large providers offer APIs and associated services for smaller organizations to leverage AI and machine learning, these companies can in turn create their own platforms for clients to use unstructured data—everything from insights from uploaded photographs to recognizing a user’s emotion based on facial expression or tone of voice—in their own apps and products. Meanwhile, the ever-increasing power of cloud platforms like Amazon Web Services and Microsoft Azure will give these computing-intensive app platforms the juice they need to become deeper and richer. These business services will depend on easy ways to exchange and implement data for success. The good news is that finding easy ways to share data isn’t hard and the API and SDK offerings that fuel the platform economy will become increasingly robust. Thanks to the opportunities generated by these new platforms and the new opportunities offered to end users, developers, and platform businesses themselves, everyone stands to win—if they act soon. D! Bernd Leukert is a member of the Executive Board, Products and Innovation, for SAP. Björn Goerke is Chief Technology Officer and President, SAP Cloud Platform, for SAP. Sethu M is President, Mobile Services, for SAP. The reality is more seasonal marketing emails are pushed out in Q4 than at any other time throughout the year. Does that sound true for you and your own inbox? Those piloting the filters probably would agree, and you can expect them to close ranks this holiday season and shut the door to a lot of retailers who are stuck in the mindset of old school, traditional email marketing. If you have access to automation tools, use them. If you don’t, get them. User engagement and deliverability in a successful marketing automation campaign will trump the traditional batch and blast method every time. Halloween, Thanksgiving, Black Friday, Cyber Monday, Christmas, the list goes on. It’s a virtual cornucopia of retail opportunities to those who can find access to the inbox. And while you should do your best to take advantage wherever you can, don’t forget automated campaigns will better feed personalization to your database and future contextual marketing campaigns. You’re sending emails to humans after all, and individuals want to see individualized content this holiday season. Utilizing marketing automation in your e-commerce solution creates the opportunity to get to know your users. And when that happens, user engagement thrives and your deliverability will follow suit. If engagement is what the email filters crave, then please feed them accordingly. Marketer vs. Consumer. Who will drive engagement? As a marketer, it’s easy to put yourself in the driver seat and base decisions about content and micro targeting around the needs of your bottom line. This is your campaign after all, right? Wrong. Although you’re offering the deals and blasting the emails, the consumer is, or at least should be, viewed as the driver steering the relevant content. Your campaigns are just the gas, brakes, and clutch of the email campaign. Email engagement and deliverability, particularly in the retail space, is consumer driven. Traditional engagement campaigns this holiday season will continue down that path of batch and blast email delivery using only a few targeting segments. And that’s also how they will base their promotional deals and seek to convert users. Some may even be successful at it. However, if engagement truly is what moves campaigns to the inbox. Wouldn’t it be better if those marketing models are more contextual in nature? Ultimately, being adaptive and valuing the user’s experience is what will drive a real consumer-led campaign. Those are the campaigns I see trending the best engagement rates and the ones getting better access to the inbox. Which in turn drive more meaningful website traffic and leave behind fewer abandoned shopping carts and conversions at point of sale. Beauty is pain. How pretty is your email list? If your email list is stacked with what you believe are active contacts, that is awesome. But how many of those contacts are actively engaged with your messaging campaigns? Any solid email platform should contain tools for automating some of those list hygiene efforts. Now suppressing hard bounces is a given, I’m also talking about tools that can be structured to identify things like excessive soft bouncing and email fatigue rules. Nobody likes to willingly remove a valid email from their list, particularly if it’s still mail-able. However, if user engagement is your pipeline to the inbox, then there is no sense in risking your deliverability this holiday by sending to those who aren’t responding. Continuing to do so likely will harm your overall deliverability and inbox placements. I can appreciate the need for a good re-engagement campaign, but prospecting to the now unengaged user can almost be like door-to-door salesmanship. If you knock on the same door enough times then, sure, someone may open or eventually report you to the authorities (hit the spam button). The ISPs/filters are intelligent systems. Even if that un-engaged recipient never complains, the filters will pick up on your unwillingness to give up and chances are other users will start funneling to the spam folder consequently. Even worse, the un-engaged could be turned into a recycled spam trap. So please keep your list pretty (and on the nice column) this holiday shopping season. There has to be a threshold where you are willing to cut ties with disinterested email recipients. Will you let engagement determine your deliverability? That question is rhetorical. Really. Sorry, you don’t have a choice in the matter. The filtering agents deployed today are more advanced, more intelligent than ever. They are only going to get even more strict with allowing access to the inbox as we approach peak holiday season, too. The deliverability of your email campaigns are consistently being weighed and measured by robots that hold all of the keys. This can make prospecting a nearly impossible feat, and, in fact, doing so heavily is actually starting to work against many email marketers. I’ve often said in the past the purpose behind automation isn’t to create lazy marketers. It’s to help pull information from your list so you can trend and target recipients based on things they will care about. Exploiting those unique characteristics, probing human curiosity, and aggregating data is how to build genuinely responsive content that bonds with users. This promotes engagement and builds on your deliverability. Also, it’s how you harness data that can even generate interest in users for things that they may not yet even realize they were interested in. If it sounds like science fiction, it’s not. It’s automation! Although not every engaged user will necessarily convert this shopping season that is okay. The point is they are engaging with your emails and can now be a part of a larger, more meaningful dialog with your organization. It is in that conversation you’ll find a true path to the inbox and better access to improved deliverability. PowerObjects’ Annual Holiday Party was a “Dynamic” Success!